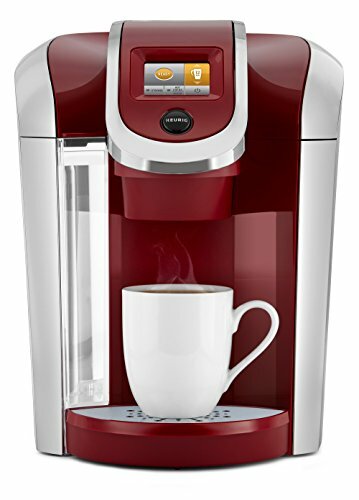 A Premium and Customizable Single Serve Keurig Coffee Maker, the Keurig K475 brews a rich, smooth, and delicious cup every time with the quality you expect from Keurig. With a strength control setting for a bolder brew, five temperature settings, and multiple K-Cup, K-Mug, and K-Carafe pod brew sizes, you can customize your settings to get your perfect cup. Plus, an easy-to-use large color touch screen with a digital clock makes your brewing experience stress free, and you can even program your brewer to turn on or off automatically at set times. Whether you like your coffee strong, mild, decaf, or flavored, you can brew all of your favorites with the Keurig K475 – and with large 70oz water reservoir, you can brew 8+ cups before having to refill. Discover hundreds of K-Cup pod varieties from all of the brands you love, including Green Mountain Coffee, Starbucks, and Lipton, and enjoy coffee, tea, hot cocoa and more. Available in several colors to complement any décor, and also compatible with the Keurig Plus Series My K-Cup Reusable Coffee Filter, so you can brew your own ground coffee. Keurig Single Serve Coffee Makers are expertly engineered to deliver a consistently delicious beverage experience, giving you the same great taste, cup after cup. You can create and customize your perfect beverage, at the touch of a button, and prepare coffee, tea, cocoa and more just the way you like it. All Keurig brewers also dispense hot water, adding to their versatility. A large 70oz water reservoir allows you to brew 8+ cups more before having to refill, saving you time and simplifying your morning routine. The water reservoir is removable, making it easy to refill whenever you need to. A large color touch screen with a digital clock makes it easy to brew a fresh, great tasting cup in under a minute. Plus, program your brewer to turn on or off automatically at set times, so that it is ready to go when you want it, and turns off to conserve energy.